AM I NEXT? 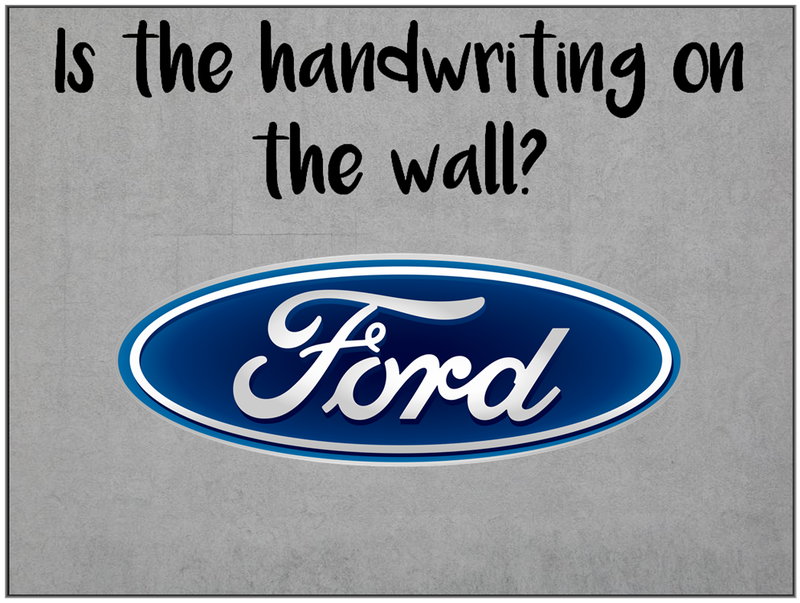 IS THE HANDWRITING ON THE WALL AT FORD? (UPDATED) — AM I NEXT? UPDATE: MARCH 14, 2019 FORD ANNOUNCES U.S. JOB CUTS ARE HERE. REFUSES MORE DETAIL AT THIS TIME. Many Wall Street analysts, including Morgan Stanley’s automobile sector Adam Jonas, have noted that Ford plans to release details of an upcoming restructuring effort in 2019. According to a Ford spokesperson, "As we have said, we are undertaking restructuring activities that could result in potential EBIT charges of $11 billion, with cash-related effects of $7 billion, over the next five years," Ford spokeswoman Karen Hampton said in a statement. "These actions will come largely outside of North America. This includes the targeted and thoughtful approach we are taking to the redesign of our global salaried workforce. All of this work is ongoing and publishing a job-reduction figure at this point would be pure speculation." The message was reinforced by Ford CEO Jim Hackett who has publicly commented on the company’s plans to cut $25.5 billion in operating expenses over the next several years. and spend $11 billion to restructure. Speculation or not, some suggest that Ford’s reduction in force could be larger than General Motor’s announced reduction which could range between 8,000 and 14,000 employees worldwide. Bloomberg speculates the number could go up to 25,000 employees. Jonas notes that Ford's $11 billion implies 20 plants and 50,000 employees would be cut. Ford, however, has given no indication of any planned closures or layoff numbers. We estimate a large portion of Ford’s restructuring actions will be focused on Ford Europe, a business we currently value at negative $7 billion. But we also expect a significant restructuring effort in North America, involving significant numbers of both salaried and hourly UAW and CAW workers." Ford’s Statement on Business Transformation can be found here. It is likely that personnel reductions may occur in small phased batches to avoid creating major headlines and employee anxiety as the restructuring plan is implemented.